MeCp2, methyl CpG binding protein 2, is a chromosomal protein that binds to methylated DNA (1). It can bind specifically to a single methyl-CpG pair and is not influenced by sequences flanking the methyl-CpGs (1). MeCp2 mediates transcriptional repression through interaction with histone deacetylase and the corepressor SIN3A (2). Defects in MECP2 are the cause of Rett syndrome, a progressive X-linked neurologic developmental disorder that causes mental retardation in females (3). Recombinant human N-terminal His tagged MeCp2 was produced in SF9 insect cells, purified using FPLC and formulated in a storage buffer containing 20mM Tris-Cl pH 7.6, 1mM EDTA, 0.15 M NaCl, 10% glycerol, 0.5mM PMSF and 1mM DTT. Protein concentration was determined by spectrometry. >95% purity by SDS-PAGE. 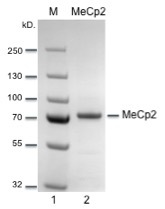 SDS-PAGE gel of recombinant MeCp2 (Lane 2). Lane 1, protein molecular weight marker. Double strand methylated DNA (lane 1) was incubated with increasing amount of recombinant MeCp2 protein (lane 2-4) and run on native PAGE . A 70 bp methylated DNA (50 ng) was mixed with competitor DNA (200 ng), followed by incubation with various amounts of MeCP2 in binding buffer (50 mM NaCl, 20 mM Tris-Hcl, 0.25 mM EDTA [pH 7.65]) at room temperature for 30 min. DNA was immediately electrophoresed on 6% native polyacrylamide gel 0.5× TG (0.025 M Tris, 0.192 M glycine) and run at room temperature. 2. Nan et al., Nature. 1998 May 28;393(6683):386-9. 3. Amir et al., Nat. Genet. 23:185-188(1999).